- Before you attack, always look at the numbers above the heads of your opponents. They indicate how many rounds the corresponding pig will attack. One of the most important tips is to destroy the pigs with the low numbers first, because they attack more often than those with the higher numbers. - However, there are exceptions. If there are bigger pigs in the arena, whose heads indicate three, and even small ones over whose heads indicate one, then you should first devote yourself to the bigger ones. They sometimes have very strong attacks and can do more damage than the little ones who will attack faster. - If you attack the pigs directly in front, you will never inflict maximum damage on them. Look at the arena carefully. There are always rocks or barricades that you can use to attack the pigs from behind. In this way, you get more HP. Use the dotted line to predict the distance of the bird. - In the arena, you will regularly find power ups. They are activated immediately when your bird slips. There are different types of power ups. Some will heal you, others will increase your speed or attack strength. If your health track is full, you can try not to collect the Power Up for healing. But it will not be easy. - Your birds have special covers. 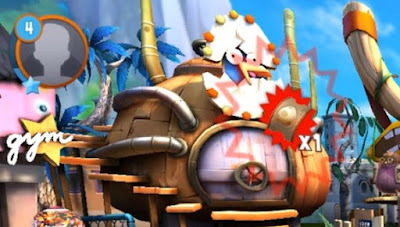 The number above the heads of the Angry Birds shows you how many rounds the Super Attack will be available. When the number arrives at zero, a flame surrounds your bird. You'll see that you're going to do a special attack next time. It is the same as with the simple attacks. Finger up, aim and release. The birds' reefing makes them stronger and gives you more space in the inventory. This is somehow narrow. Since you have to sacrifice other birds to improve the Angry Birds, it is always better to level the birds that have many stars. Then sacrifice that which has only one star. For more, we recommend you not to use the one-star birds. You can merge two birds of the same color, doubling the XP. But the power of your birds also benefits from mixing the same colors together. If you improve a yellow bird with a white, the strength will increase by 12 points. For yellow and yellow, it is 28 points, the numbers being only one example. If you want to know in advance how much force points a fusion would bring, then pull the second bird into the appropriate field and do not drop it yet. The numbers are displayed to you. Simply drag to compare other birds that you would sacrifice and choose the strongest fusion. If you want to develop a bird to its next evolutionary stage, you must first bring its level to maximum. Then go to "Evolution" and drag the high-level bird into the empty place. If you have the necessary evolutionary coins, your bird will take a new form. During the battles and also during a victory, you get eggs. You will also get tickets that you can use to hatch eggs. If you play daily, you will receive a daily reward. It is worthwhile, because tickets can be included in the package. If you watch a video in the hatchery, you even get a premium egg that can contain a stronger bird. Collect the birds, then use them to merge. Of course, you can also exchange your birds for evolutions. Click on the bird you want to exchange and then press the sell button. Be careful not to accidentally replace a shiny Angry Bird. These have the advantage that they always have a double XP value.